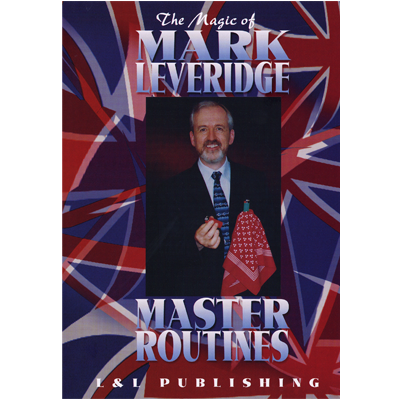 For 25 years, Mark Leveridge has been a professional magician earning his living by performing, lecturing and selling his exclusive creations to the magic world through his business, Mark Leveridge Magic. Every single year during that time, Mark has produced a range of new, original ideas and products and so has amassed a solid body of work covering close-up, stand-up, mentalism and even children's effects. Because Mark is a performer, his magic usually has a commercial bias and his routines and methods are designed to be practical and workable. The effects on these downloads reflect Mark's approach and attempt to provide all viewers with magic which they will genuinely enjoy and use. In 1984, Mark created The Master Routine Series. This was to be a showcase for his longer routines and over the course of the next 20 years, suitable effects were gradually added to the Series until its completion in 2003. Now for the first time on download, the complete 12 routine Series is made available and features a wide range of effects and ideas for close-up and stand-up work. Some of Mark's very best work is performed and explained here, including his highly praised Ring And String Routine which was part of the act which won Mark the IBM Close-Up Competition in the UK. 20 years is a long time to take to create just 12 routines, but hopefully the quality of the material will prove it was worth the wait. 1. THE COMMERCIAL SPONGE BALL ROUTINE - This is a fast paced, surprising sequence which Mark has used for 25 years. No reset, it builds quickly and magically to a strong finish. Great lay people entertainment. 2. THE FREE SELECTION COLLECTORS - Armed with a regular deck of cards, you will learn a killer routine comprising of several strong effects blended together into one fabulous sequence. Looks highly skilful but is straightforward to do. 3. STAY AT HOME COINS - If you like coin box magic, you will love this routine. Four coins vanish one at a time and arrive back inside a brass box before then suddenly all completely disappearing! Uses a Boston Box. 4. THE RING COMPETITION - At last, a presentation for ring and rope which is logical and which actually gets your audience clapping and cheering! Perfect stand up routine, Mark has used this in his own act all over the world. 5. WILD DICE - A fabulous table top routine which combines elements of the Cups and Balls with the Walnut Shell And Pea Game, but which uses matchbox drawers and dice. Culminates in the production of six extra dice with no loading or palming! 6. THE RING AND STRING ROUTINE - A true reputation maker, this has to be one of the most natural set of moves ever devised for making a borrowed ring penetrate on and off a shoe lace. Mark won the British Ring IBM Close Up Competition using this routine.